A toddler aboard Royal Caribbean's Monarch of the Seas reportedly fell from an upper deck to a balcony one deck below shortly after the ship left Port Canaveral Friday afternoon. Royal Caribbean said the 14-month-old child was treated at the ship's medical facility, but the injuries were extensive enough that the ship returned to Port Canaveral where the child could be airlifted to a hospital in Orlando. Monarch of the Seas departed Friday (Dec 22, 2012) on a 3-night cruise to Coco Cay and Nassau. Details will appear in the next edition of Cruise News Daily. Last month when the Brooklyn Cruise Terminal was closed due to damage during Hurricane Sandy, Queen Mary 2 instead sailed from the cruise terminal in Manhattan, giving us a rare (these days) chance to see her sailing past the famed Manhattan skyline. Making it all the more romantic was the nighttime departure. Luckily our favorite New Jersey YouTube ship videographer, NJPhotographer62, was there to capture it for us. You can almost hear Frank Sinatra singing. Carnival Cruise Lines said today they would expand capacity at Long Beach by moving Carnival Imagination there for 3- and 4-day cruises beginning January 26, 2014. Once repositioned, Carnival will operate three ships from Long Beach. Carnival Imagination will join Carnival Inspiration and Carnival Miracle which will continue to operate their respective programs from the Southern California port. Carnival Imagination is currently sailing short cruises from Miami. Carnival Ecstasy, now operating from Port Canaveral, will reposition to Miami to assume Carnival Imagination's program of short cruises from Miami to the Bahamas. Additional information will appear in today's edition of Cruise News Daily. Norwegian Cruise Line has opened the books on their Caribbean and Bahamas programs for the winter 2014/2015 season. The line will have eight ships in the Caribbean, with the bulk of the choices and marquee ships in Miami and New York. Norwegian will also have ships in Tampa, New Orleans, and 2014/2015 marks their return to Houston. Details appeared in the December 19, 2012 edition of Cruise News Daily. 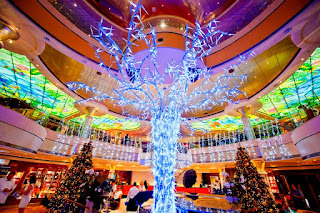 If you are cruising over the holidays, you get to see your cruise ship like at no other time of the year. Cruise lines make a point of decorating their ships in various styles from the tastefully understated to the spectacular. 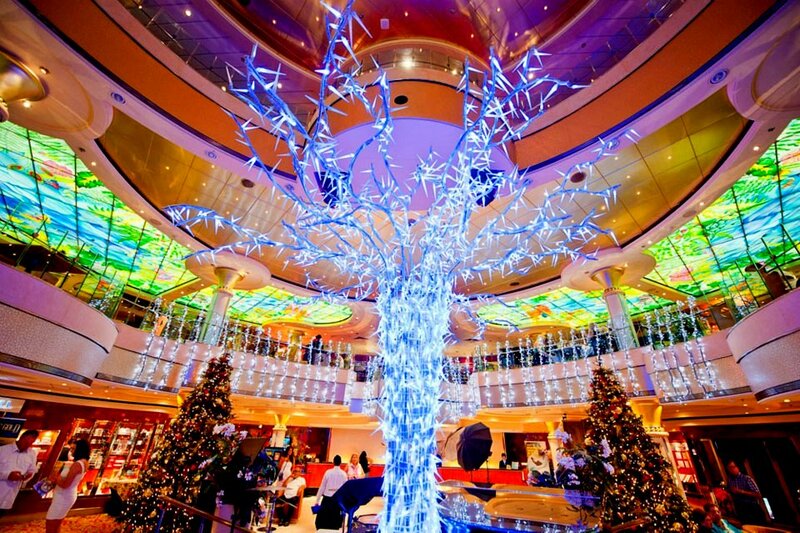 Here is Norwegian Star's atrium decked out for the holidays in one of the more modern and creative ways we've seen. Photon courtesy of Norwegian Cruise Line. Royal Princess is currently under construction at Fincantieri in Italy. It will debut in June 2013. HRH The Duchess of Cornwall spent the day aboard Cunard's Queen Victoria last week marking the fifth anniversary of her christening the vessel. While aboard, she attended several events including the unveiling of a new portrait which will be displayed aboard Queen Victoria. In this video, Cunard President Peter Shanks describes the duchess' time aboard the vessel. Below the report which aired, we have some web extras that give some interesting behind the scenes perspectives on the 60 Minutes story. In the first web extra, CBS shows how the crew shot the footage of the ship. The next web extra is a clip from the interview with Nick Sloane of Titan Salvage talking about how they used supercomputers to do the calculations for the design of the salvage operation. In the third web extra, senior salvage master Nick Sloane tells Lesley Stahl why the ship weighs so much -- and why it's an environmental priority to remove it in one piece. In the last web extra senior dive master Jimmy Conroy has been working on the wreck for months on end, but says he feels honored to be part of a project that's attracted "some of the best maritime talent in the world."